Details Spanish red is a brown red natural earth based on hematite deposits in Spain containing 85% iron oxide. It is a strong tinting color that is opaque. Synthetic Names: Mars red is the name given to the synthetic precipitated form of red iron oxide. Spanish red was the name given to red ocher and iron oxides produced in Spain since antiquity. After the 16th century, red ocher pigments produced in other countries were often given the name of "Spanish red" because of the popularity of the pigment among artists. Natural reds such as Spanish red or Persian red contain at least 50% iron oxide as hematite with tinting strength increasing with α-Fe2O3 content up to 95%. Spanish red (red iron oxide) is produced in Spain by leaching a massive crude deposit with bacteria suspended in water. The mix is sprayed on the ore, and the run-off collected and chemically treated to recover high-purity iron oxide. The mine in Spain produces a red iron oxide purity that ranges from 83 to 88% by weight. Minerals containing iron oxide yield pigments that are nontoxic, non-bleeding, relatively inert, weather resistant, and light fast. 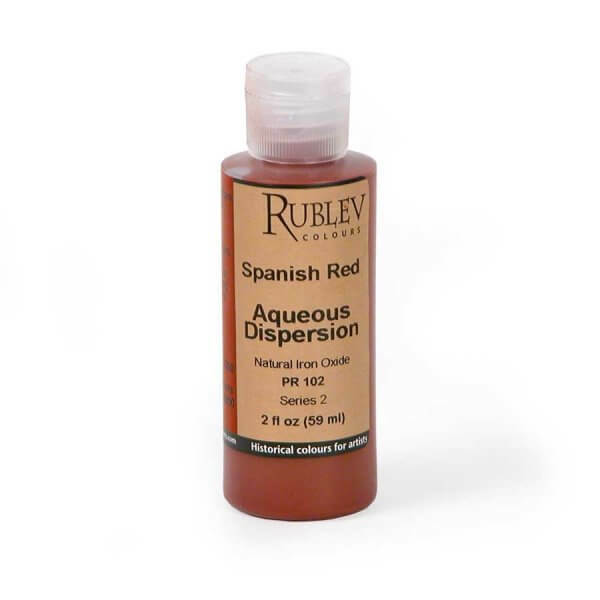 Spanish red is permanent, light fast and can be used with all pigments and in all vehicles. Spanish red absorbs a moderate amount of oil. Spanish red is not classified as harmful if swallowed or as irritating to the eyes or skin. Care should be used in handling the dry powder pigment to avoid inhaling the dust.